I was born and brought up in Wimbledon and began my teaching career in 1979. For the past 21 years I have been a Head Teacher; the last three of which have been as Executive Head Teacher of the Trust. I am married with two sons. My wife, Agneta is Swedish and a Deputy Head Teacher at a local primary school. Marcus, my eldest son works in the oil industry and Dan is a teacher. In my spare time I am a passionate season ticket holder at Chelsea football club and in recent years my wife and I have increasingly travelled the world during our summer breaks. I have strong personal connections with Chipstead Valley - my children were educated at CVPS 2006-2014, my nephew has just joined Reception, my wife works at CVPS as part of the office team, and I am an ex pupil. I believe in community and feel that I have a responsibility to support through volunteering. We are doing important work as Governors. Chipstead Valley is an outstanding organisation in many many ways, and I am proud to be play a part in its continuing success. Update October 2017. As the CVAT (Chipstead Valley Academy Trust) grows, I have stepped down as Chair of the CVPS LGB in order to concentrate my attention on the CVAT Board, including getting a closer feel of Beecholme and New Valley. Born and brought up in Worcester, I moved to Coulsdon in 1983. My connection with Chipstead Valley Primary School began in 1989 when the first of my two sons entered Reception. After serving two years as Treasurer of the PTA I was elected a parent governor in September 1993 and have served continuously on the Governing Body since then, becoming Chair in October 2002. 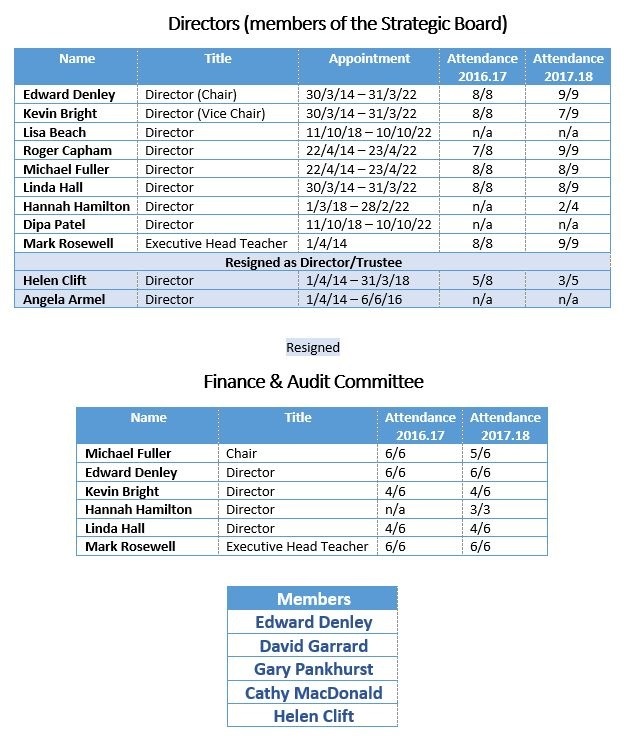 I was elected Chair of Directors of the Academy Trust on its foundation in April 2014. A qualified accountant since 1982, I have worked for over thirty years in major companies in the private sector, including over twenty years for British Telecom. In 2009 I moved to the public sector and joined the Department for Work and Pensions where I worked on reform of private pensions. I retired in December 2017. As well as my work with the Trust I am active, together with my wife, in Saint Andrews Church in Coulsdon and we are both members of the local Downland Chorale choir. Other interests are gardening, American Football and boardgames. I was born in Clapham, London and moved to Sutton in 1971. I am married with three children and five grandchildren. My youngest child still lives at home. I love gardening, arts and crafts, photography and exploring the countryside and cities at home and abroad. I started teaching when I was thirty following a career in retail. I was a headteacher for twenty years, fourteen as the head of Keston Infant School and six as the head of the amalgamated infant and junior schools, Keston Primary School. I was very active in promoting inclusion for children with Special Educational Needs and have a diploma for SENs in main stream schools. I was also involved in many government initiatives as a leader of school improvement. Following a visit to my school I was asked by Chris Woodhead (Chief Inspector for Schools) to be an additional inspector for Ofsted, inspecting the teaching of Literacy in ITT colleges for PGCE students. One of the highlights of my career was being invited to meet Prince Charles at Highgrove. I went on to work for London City Challenge as a team leader and continued in this role after my retirement. I became a consultant and School Improvement Partner working in Wandsworth and Sutton. I joined the governors at Chipstead Valley Primary School in 2009 and then became a director. I am now a governor at New Valley Primary School. I have been a Governor/Director at Coulsdon Nursery Scholl/Chipstead Valley Primary School for thirteen years since 2004. Additional Roles: I have been a Member of the Schools Forum – Croydon for twelve years since 2005. Currently on the Early Years and High Needs Working Groups. Business/Profession: Insurance Executive – Retired. I am the Company Secretary for a major national Housing Association which provides housing for older people across England. Prior to this I spent 21 years in Banking where I had a number of management roles in operations and credit. I became a governor at Chipstead Valley soon after my son entered Reception in 2008 and have served since then on various governing bodies and committees. I currently Chair the Finance and Audit Committee and am a Governor of New Valley Primary School. I have also recently been appointed a Governor at St Bede's School Redhill where my son is now in year 9. I work for the NHS and am Regional Finance Director for the South of England. I was born in India and came to the UK on my first birthday in the 70s. I grew up and went to school in the Crystal Palace area and moved to Coulsdon in 2012. I’m a Civil Engineer by profession and work for an international professional services firm who provide technical, professional and construction services. My husband and I have two young daughters at a trust school and I have a passion for education hence have been a governor (parent governor, vice-chair and now chair) for some time now. In my spare time I love to play netball, I play for a local team in a local league. Additional roles: Joint Chair at Keston Primary School. Business/Profession: Civil Engineer and Operational & Business Management. Born and brought up in Oldham, Manchester, I moved to Coulsdon in 2011 with my husband, Phill and daughter, Emily. Then in 2015 we had our son, Oliver. Both our children now attend Keston Primary school, where for the past 3 years I have been a governor and love to go in and help out when I can. For the past 18 years I have worked within Local Authority finance in various roles as an accountant dealing with with both Management and Financial accounts. In my spare time I love to go to the gym and socialise with friends, but the majority of my time is spent chauffeuring my children to their various events. Additional roles: Local governor at Keston Primary school, chair of Finance committee and maths lead.